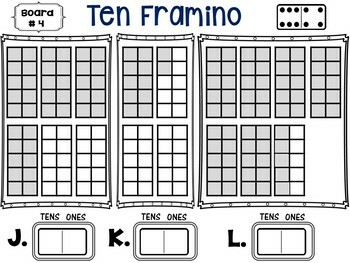 Ten Framino is an interactive place value game that combines ten frames and dominoes, in a fun and unique way. 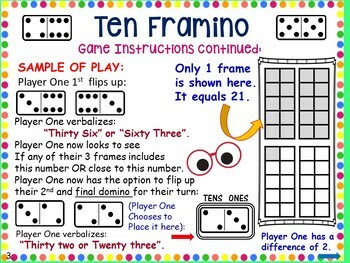 Children flip dominoes and set them as numbers in place value and must decide where to place their dominoes, to get as close to their "ten frame" number as possible. Detailed game instructions with samples of play, allow the rules to be taught in a simple and straightforward manner. Children can work in cooperative teams or pairs, while attempting to build a "winning game board". Alternatively, children can compete to fill their boards and compare to see who has the least overall difference. 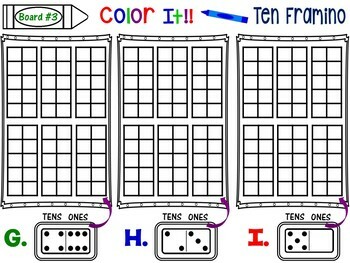 There are 8 different sets of game boards and each set includes an Answer Key and an extra "Color It" board that challenges young students to demonstrate their learning. 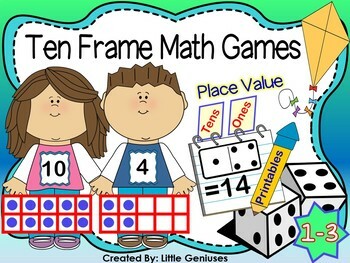 Your "Little Geniuses" will have fun learning essential math skills with these fun activities and so will you! Thank you to My Cute Graphics for the wonderful clip art.